The upsized 2 inch leather straps on this gear frame larger men beautifully. Our Buckled Leather Men's Harness is iconic. But we've noticed the straps sometimes seem too narrow on some men. 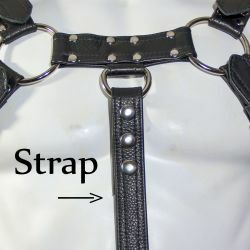 The straps and hardware on this harness have all been upsized, and the effect is impressive on the men who can wear them. 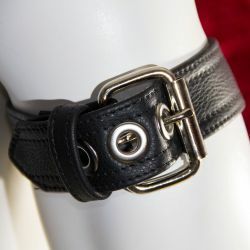 It's worn with the ring in the center and sensual leather straps wrapped tightly around your chest. Add a matching torso strap for a 5 point harness to complete the look. This harness works for larger body types. All genders.